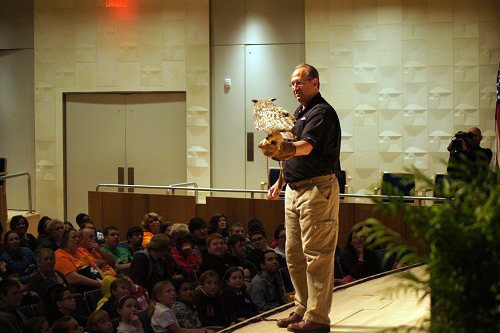 Wildlife Encounters brings the WILD to your event! Attendees love seeing and meeting some of the worlds most amazing animals which will leave them talking about your events for months! Nothing draws a bigger crowd than animals. Adults and children naturally are drawn to seeing, learning and experiencing the amazing animals we share this planet with. 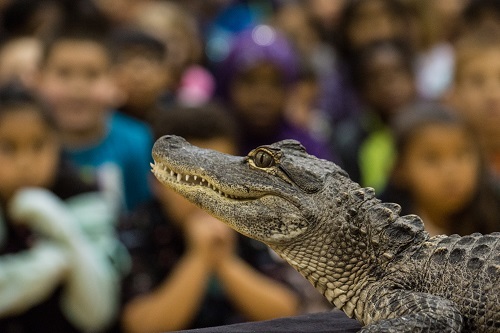 Your audience will be thrilled to see an alligator open its huge jaws, a serval jump 6 feet in the air, and even help us hold a giant boa constrictor. Connecting your audience to the great outdoors is an easy task when animals are involved. We can set up on your supplied staging area or bring our own. Our portable hydraulic stage complete with custom graphics, PA system, themed animal music and more is completely mobile for any event. Whether you want us for a day, weekend or a week we are prepared. Give you visitors a chance to interact with some amazing animals up close! They can have the opportunity to pet a tortoise, feed on of the largest rodents in the world, touch a snake and ask our animal experts wildlife questions. Want to bring a little "WILD" into your next conference or corporate event? With our highly knowledgeable presenters, amazing animals and high level of audience participation we will be the highlight of your event!